Are you one of the guys who do nothing at home and want to earn extra but are conflicted between taking a rest and doing part time job? Here’s a thing that will allow you to work and stay at home at the same time. Online job. There are tons and tons of advertisements in the Internet that offer freelance online job BUT here’s the catch: most of them are paid! We are looking for an online job because we need extra cash so it would be a little difficult to let go a few money in order to work, right? But I have found a site that will allow you to work for free online jobs. And this is legit for I have been using this myself. And no, this free online job does not require you to market the site. You know, the usual click and bait thing nor does it require you to be qualified first before you can get paid. This free online job site also do not necessitate you to acquire certain amount first before you can withdraw your money. Excited yet? Here we go. This micro job site that offers free online job is called Fiverr. I discovered this last year and when I first got it, I was confused. Fiver is a free online job site that allows you to create your own account where you get to upload information about your services, or as they call it, gigs. These gigs should be what you can do. And what you are really good at! It can be painting, writing, editing, web development, voice over, singing, composing and so on. It is called Fiverr because their flat rate is $5. But you get to decide what $5 can do for your clients. This is the minimum rate which means that you can charge more depending on the requirements of the project. You get paid online and you can track your payments via your site. You get paid via PayPal and other online payment methods. Check this info so you can get more details. How do I get noticed if I am a newbie? Easy peasy! This free online job site promotes newbies! Yes they do. During my first three months, I always receive promotional emails that include my gigs in it! So this is not like other free online job pages where you almost don’t get a chance unless you pay so your account becomes premium whatsoever. 1. Your gigs must be the thing you are good at because clients will give you reviews and for every positive rating and review the more chances you get to be introduced to more clients. You can even write a review for your client as well. 2. Be alert. Check your email every day. Your response to clients is also rated; they want to know how soon you can respond to questions. Be sure you are always responsive. 3. Be accurate with your services. What is inclusive in your $5 service? How soon can you deliver? How many words can you write? How many people can you draw in one project? Will you be using SEO? Will you edit? Add effects to voice? Do you also write the script? If it needs to be delivered, is it for free? How much will you charge for that? Like I said, this free online job site does not require you to ‘apply’ for a job. Clients will be the ones to communicate with you. But you can increase your chances by promoting your gigs via social media. It is for free. In Fiverr, free online job hunt is a piece of cake! Here, I am a One Star rated seller (as indicated by the green dot). And beside that is the available funds. These are payments that is deposited to your account at least 14 days after your submission of your project. They also have easy to navigate tabs. 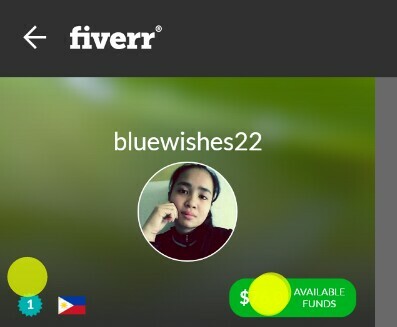 You can also check your account anytime by downloading the free Fiverr app. They also promote sellers or people like you to certain ranks and of course the better ratings, the faster you get promoted! Wanna get started now? Check this free online job site now!